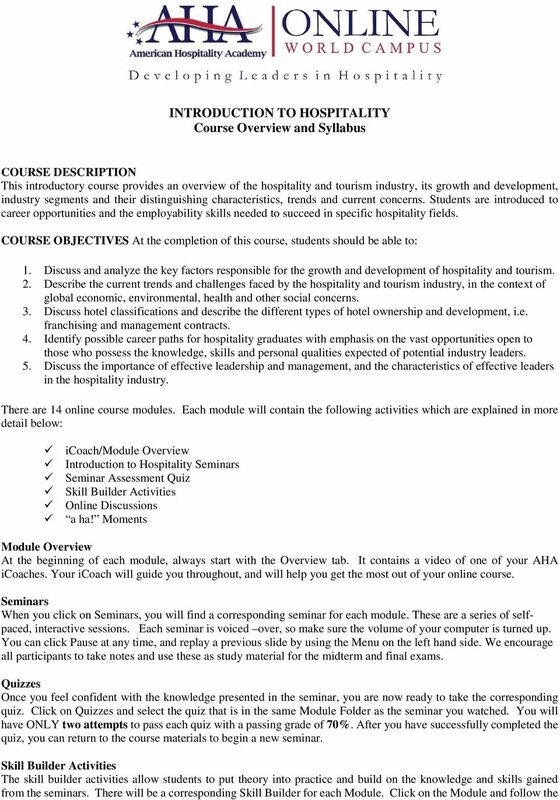 Download "INTRODUCTION TO HOSPITALITY Course Overview and Syllabus"
2 instructions. Each Skill Builder is worth 5 points. Students receive 5 points for completing them and 0 points for an incomplete activity. Online Discussions The discussion forum allows students to reflect on their experiences and share these experiences with peers, online faculty and AHA icoaches. There will be a corresponding Discussion for each Module and they are worth 5 points each. Click on the Module and reply to the various discussion posts. Students are required to post a reply and one response per discussion in order to earn the 5 points. Module Progress Once you click on a module inside your Introduction to Hospitality course, you will see a detailed overview of the required activities for each module. Examinations Two examinations will be given for this course: the midterm examination covers Modules 1-7 and the final examination covers Modules After you have fully completed Modules 1-7 you will find your midterm exam located on the Module 7 progress checklist. After you have fully completed Modules 8-14 you will find your final exam located on the Module 14 progress checklist. Before taking your final exam, you will be asked to complete a course evaluation to help AHA further enhance our system and courses. Please note that your midterm and final exams are automated and ONLY come on when you have completed ALL activities. Each module must have all green checkmarks in order for the midterm and final to be activated. Grading and Special Designation A student must have a minimum grade of 70% to earn the course certificate from AHA. NOTE: The (AHA) Introduction to Hospitality course grade may differ from your final school grade as your school may have a different grade criteria and percentage allocation. The grade from your school is the official grade that will be seen in your Transcript of Records. Students who receive a final grade of 93% or higher will receive a special citation from the American Hospitality Academy. 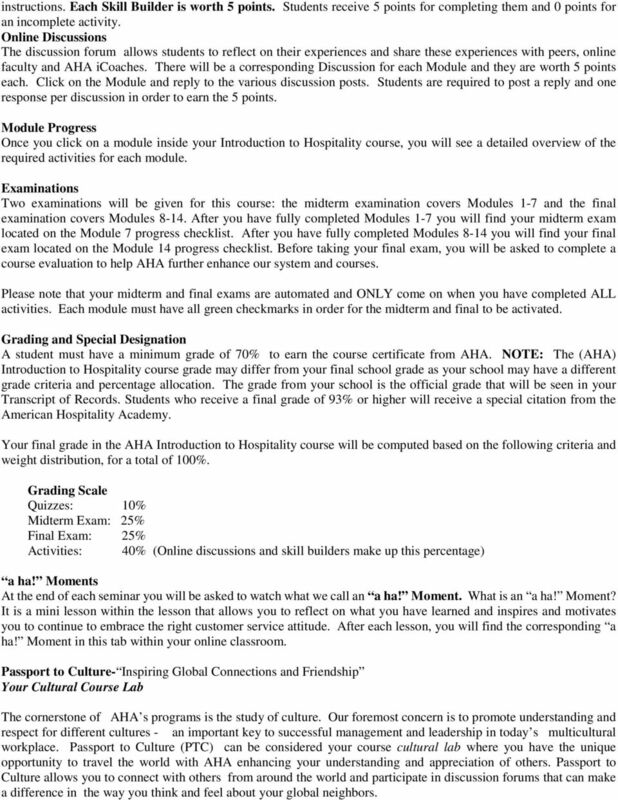 Your final grade in the AHA Introduction to Hospitality course will be computed based on the following criteria and weight distribution, for a total of 100%. Grading Scale Quizzes: 10% Midterm Exam: 25% Final Exam: 25% Activities: 40% (Online discussions and skill builders make up this percentage) a ha! Moments At the end of each seminar you will be asked to watch what we call an a ha! Moment. What is an a ha! Moment? It is a mini lesson within the lesson that allows you to reflect on what you have learned and inspires and motivates you to continue to embrace the right customer service attitude. After each lesson, you will find the corresponding a ha! Moment in this tab within your online classroom. Passport to Culture- Inspiring Global Connections and Friendship Your Cultural Course Lab The cornerstone of AHA s programs is the study of culture. Our foremost concern is to promote understanding and respect for different cultures - an important key to successful management and leadership in today s multicultural workplace. Passport to Culture (PTC) can be considered your course cultural lab where you have the unique opportunity to travel the world with AHA enhancing your understanding and appreciation of others. Passport to Culture allows you to connect with others from around the world and participate in discussion forums that can make a difference in the way you think and feel about your global neighbors. 3 Extra Credit Points PTC compliments your existing courses by allowing you to earn extra credit points for each stamp collected. The more activities and connections you make, the more stamps you receive in your passport. Extra credit points are earned on your final grade with AHA, based on the number of stamps you collect. Two points per stamp collected can be earned with a maximum of 12 extra credit points on your final grade. 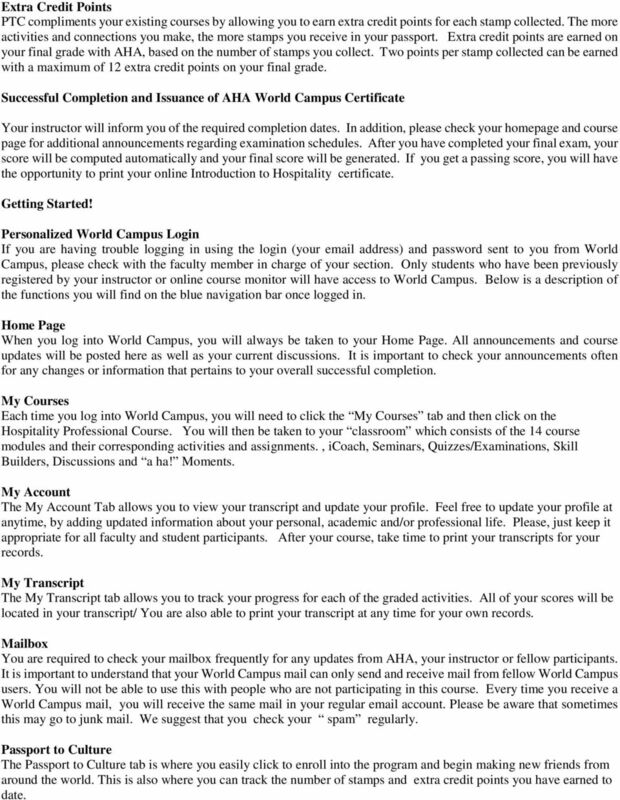 Successful Completion and Issuance of AHA World Campus Certificate Your instructor will inform you of the required completion dates. In addition, please check your homepage and course page for additional announcements regarding examination schedules. After you have completed your final exam, your score will be computed automatically and your final score will be generated. If you get a passing score, you will have the opportunity to print your online Introduction to Hospitality certificate. Getting Started! Personalized World Campus Login If you are having trouble logging in using the login (your address) and password sent to you from World Campus, please check with the faculty member in charge of your section. Only students who have been previously registered by your instructor or online course monitor will have access to World Campus. Below is a description of the functions you will find on the blue navigation bar once logged in. Home Page When you log into World Campus, you will always be taken to your Home Page. All announcements and course updates will be posted here as well as your current discussions. It is important to check your announcements often for any changes or information that pertains to your overall successful completion. My Courses Each time you log into World Campus, you will need to click the My Courses tab and then click on the Hospitality Professional Course. You will then be taken to your classroom which consists of the 14 course modules and their corresponding activities and assignments., icoach, Seminars, Quizzes/Examinations, Skill Builders, Discussions and a ha! Moments. My Account The My Account Tab allows you to view your transcript and update your profile. Feel free to update your profile at anytime, by adding updated information about your personal, academic and/or professional life. Please, just keep it appropriate for all faculty and student participants. After your course, take time to print your transcripts for your records. My Transcript The My Transcript tab allows you to track your progress for each of the graded activities. All of your scores will be located in your transcript/ You are also able to print your transcript at any time for your own records. Mailbox You are required to check your mailbox frequently for any updates from AHA, your instructor or fellow participants. It is important to understand that your World Campus mail can only send and receive mail from fellow World Campus users. You will not be able to use this with people who are not participating in this course. Every time you receive a World Campus mail, you will receive the same mail in your regular account. Please be aware that sometimes this may go to junk mail. We suggest that you check your spam regularly. Passport to Culture The Passport to Culture tab is where you easily click to enroll into the program and begin making new friends from around the world. This is also where you can track the number of stamps and extra credit points you have earned to date. 4 Seminar Module Descriptions M1 Orientation The purpose of orientation is to provide you details on your course requirements and how to make the most of your online experience. M2 Hospitality and Service The hospitality industry comprising of businesses that serve guests away from home- can be defined by its scope, mission and providers. This module will help you understand the nature of the hospitality industry, its overall service mission, and the many career paths you can opt to pursue, within this very dynamic and exciting industry. M3 Spirit of Service Increasingly strong competition within the hospitality industry and the continued clamor of guests for new and exciting experiences, has raised the importance service excellence plays in the success of any hospitality operation. This module will help you develop the kind of positive and caring guest service attitude that will enable you to outdo yourself each time. You will learn to recognize what constitutes and contributes to guest satisfaction and how, exceeding these standards, directly, correlate to your personal sense of achievement and success, as a hospitality practitioner. M4 Tourism Tourism is a 24 hours a day, 7 days a week, 52 weeks a year economic driver. This module will help you understand the economic impact of tourism and how it benefits you as it offers the greatest global employment prospects. 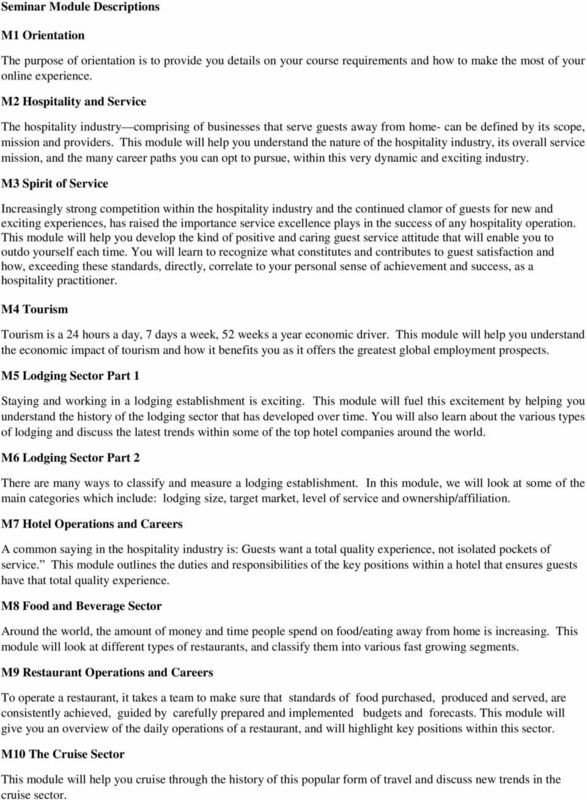 M5 Lodging Sector Part 1 Staying and working in a lodging establishment is exciting. This module will fuel this excitement by helping you understand the history of the lodging sector that has developed over time. You will also learn about the various types of lodging and discuss the latest trends within some of the top hotel companies around the world. M6 Lodging Sector Part 2 There are many ways to classify and measure a lodging establishment. In this module, we will look at some of the main categories which include: lodging size, target market, level of service and ownership/affiliation. M7 Hotel Operations and Careers A common saying in the hospitality industry is: Guests want a total quality experience, not isolated pockets of service. This module outlines the duties and responsibilities of the key positions within a hotel that ensures guests have that total quality experience. M8 Food and Beverage Sector Around the world, the amount of money and time people spend on food/eating away from home is increasing. This module will look at different types of restaurants, and classify them into various fast growing segments. M9 Restaurant Operations and Careers To operate a restaurant, it takes a team to make sure that standards of food purchased, produced and served, are consistently achieved, guided by carefully prepared and implemented budgets and forecasts. This module will give you an overview of the daily operations of a restaurant, and will highlight key positions within this sector. M10 The Cruise Sector This module will help you cruise through the history of this popular form of travel and discuss new trends in the cruise sector. 5 M11 Cruise Operations Operating a cruise ship calls for all hands on deck. This module will review a ship's organization, operations and key positions, and will show career opportunities for those inclined towards this sector of the hospitality industry. M12 The Entertainment & Gaming Sector This module explores the gaming and entertainment industry and highlights new developments with its convergence with the lodging and hospitality sector. M13 Conventions and Event Planning This module gives an overview of the conventions and event planning sector and shows how it incorporates other sectors of hospitality and tourism. In addition, you will learn about the key positions and skills needed to succeed in this sector. M14 The Peaceful Traveler A hospitality professional is expected to demonstrate a peaceful attitude that appreciates and respects all cultures. These are important to be able to assist guests and travelers with an open mind and heart. This module will help you learn how to respect cultural differences, such that these differences will no longer make any difference. ip (HAMG Hospitality 2305) Online Prerequisit completed totally online. 9 th ed. F6.4, F12.4) interviews In research, the A.
Learner Support Guide. Get Ready Get Engaged Get Results! 1. Instructional Design Elements a. Support & Resources Essential Criteria: 1. Students are provided information as to where to get technical help. I m Teaching Online Next Term. What Do I Have to Know? investigate various career options that may spark their interest. look at regions of the province to see where different jobs are in demand. Online Sections of CIS101, CIS141 & CIS240 About This Course and Getting Started Online Instructor Brad Ford Introduction The enclosed information is required reading by the end of the first week of class. Welcome to Online Introductory Biology 101 Clackamas Community College Welcome to an exciting way to learn Biology- online and at home. The attached sheet gives you the steps for getting started or "enrolled"